They're adorable, curious and taking the toy world by storm. Chances are you've heard of Fingerlings Toy Monkeys by now, but did you know there more interactive pets out there? To make sure you don't miss out on any of them – including the brand-new Fingerlings Baby T-Rex and the elusive Fingerlings Baby Panda – we put together this list of every single kind of Fingerlings available in Canada, as well as where to buy them. 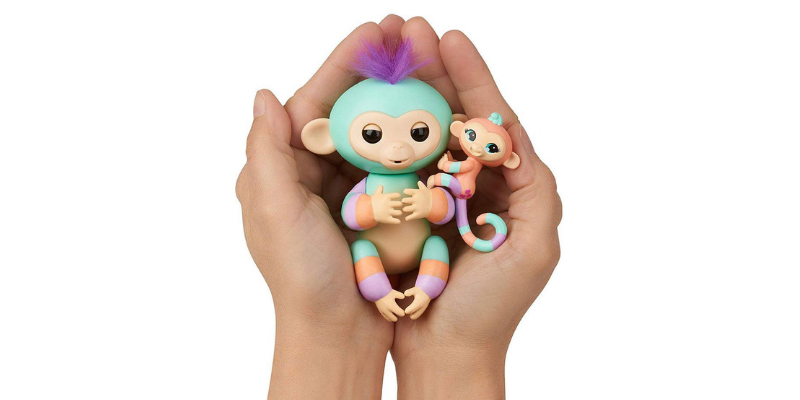 Fingerlings are little interactive pets made by toy company WowWee. They first launched Fingerlings Baby Monkeys in August 2017, and they've kept them coming since then! There are now almost a dozen different "species" of Fingerlings (and counting) – but they're all able to look around, blink their eyes, blow kisses, talk and (of course) grip your fingers. Where can you buy Fingerlings in Canada? 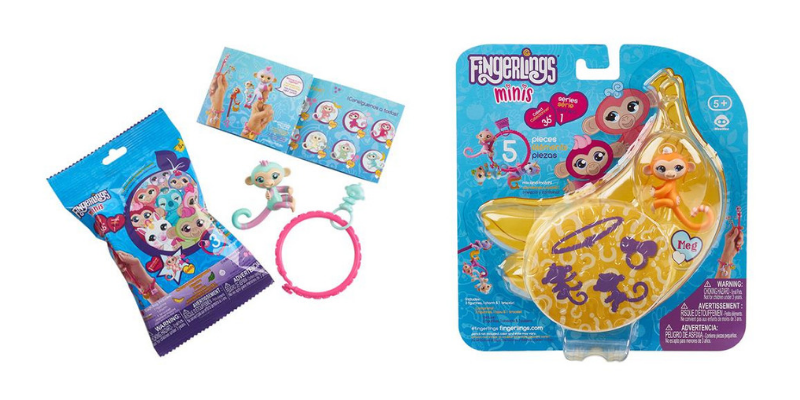 You can find Fingerlings at almost any toy retailer in Canada, including: Chapters Indigo, Amazon.ca, Walmart Canada, Mastermind Toys, Toys R Us Canada and Hudson's Bay. But whenever and wherever you find some in stock, you might want to act fast. Fingerlings tend to sell out (especially before the holidays or when they go on sale) – so don't wait! These are the original Fingerlings – and still some of the most popular ones out their. They're officially known as Fingerlings Baby Monkeys, and they're interactive pets that love to swing from your fingers, the curtains and just about anywhere else. The very first Fingerlings are making their way back into some stores – and they bought new friends with them! There are now the original six – Boris (blue), Bella (pink), Sophie (white), Finn (black), Zoe (green) and Mia (purple) – as well as new Fingerlings Glitter Monkeys and the ombré Fingerlings Two-Tone Monkeys. These might be the most magical ones of all. 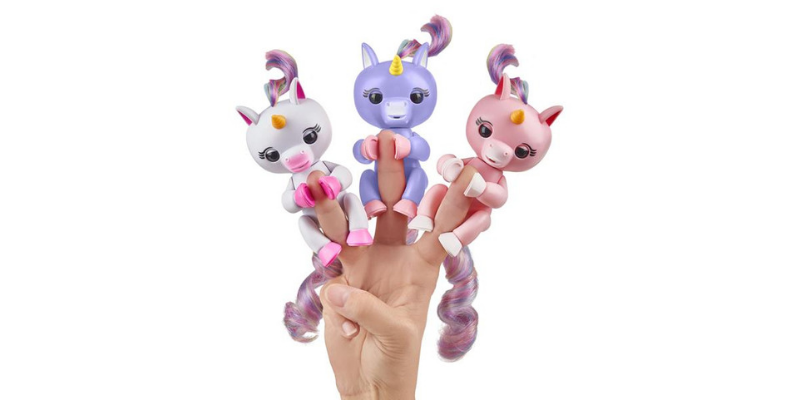 The Fingerlings Baby Unicorns were some of the most popular toys around Christmas in 2017 – and there's a chance they'll sell out this year, too. It might look there are only three different unicorn Fingerlings in Canada: Gigi (white), Alika (purple) and Gemma (pink). However, there are actually two more! Molly (green) is sold exclusively at Chapters Indigo, and you can still find Skye (bright pink) at Toys R Us Canada. Forget cute and cuddly – these Fingerlings Untamed dinosaurs are vicious! They're finger-gripping creatures who roar, hiss and chomp – but you can switch them into tame mode if you're in the mood for a nuzzling, purring pet instead. They have snapping jaws and gripping claws, and there are two different kinds of Fingerlings Untamed. 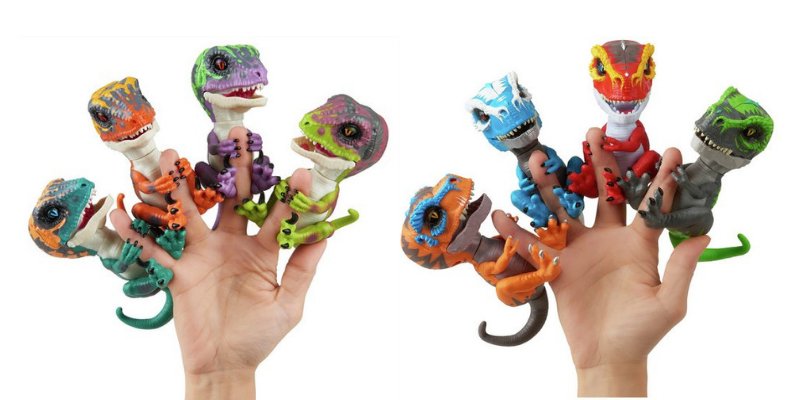 First, there were the four Fingerlings Baby Velociraptors (Stealth, Blaze, Razor and Fury), and now there are new Fingerlings Baby T-Rex toys (Ironjaw, Ripsaw, Scratch and Tracker) out there to terrorize the world! Ready to slow things down? Because the Fingerlings Baby Sloths are! They make sounds in response to your touch, and if you blow them a kiss goodnight, these friendly little pets will kiss you back. There are two little sloths available: Kingsley (brown) and Marge (purple). They both know that slow and silly is the way to your heart, and that's exactly what you'll get. It's Panda-monium! There are four new Fingerlings Baby Pandas in stores now, and they come with a special surprise: glitter. These cute and cuddly friends sparkle as they climb anything in sight. Meet the newest Fingerlings: Archie (blue), Polly (pink), Drew (black) and Beanie (purple). They all respond to noise, motion and touch. But watch out, because any loud noise will startle them! If you've always dreamed of having a pet dragon (and who hasn't at least thought about that), get ready to get one step closer. Fingerlings Baby Dragons are now available in Canada, and each one is truly adorable. These little interactive mystical creatures are hot, hot, hot – but don't worry. None of them really breathe fire. We tracked down four different ones at Chapters for you to get to know and love: Kaylin (purple), Sandy (pink), Tara (blue) and Noa (green). Everyone needs a best friend, and that includes Fingerlings, too. 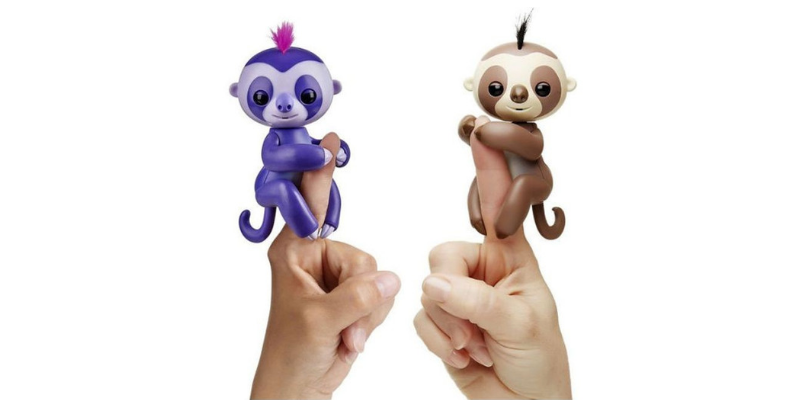 The new Fingerlings BFFs collection pairs full-size Fingerlings Baby Monkeys with their own mini friends who can hang off their tails (or your pencil). These dynamic duos come in almost every colour of the rainbow, like: Danny & Gianna (green/orange), Billie & Aden (blue/green) and Ashley & Chance (pink/green). I'm calling it. Fingerlings Minis will be some of the hottest collectibles this year. They're new to Canada and available in solo-packs or five-packs (depending on where you shop). There are more than 36 different Fingerlings Minis to collect (including the ones from the Fingerlings BFF series), including popular, rare, legendary and ultra rare Minis. There's even a challenge out there to see if people can hang 10 Fingerlings Minis in a row. Have you tried it? Did you know your Fingerlings can hang or play off more than just your fingers? While stock is dwindling a little, there are still different Fingerlings Playsets out there. Most of them are actually still available Toys R Us Canada. You can buy these sets individually or put them all together to create a giant playground for your Fingerlings friends. The Fingerlings Small Jungle Gym actually comes with an exclusive Fingerlings Baby Monkey (named Aimee). 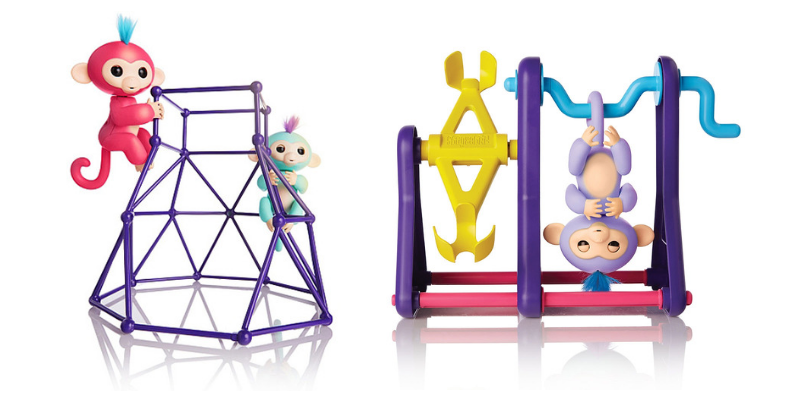 You'll score one of the more rare Fingerlings – Liv – when you buy the Fingerlings Monkey Bar/Swing Playground, and don't forget about Willy and Milly, who come with the Fingerlings See-Saw. These are one of the newest additions to the Fingerlings family – and they're extra cuddly and complete softies. 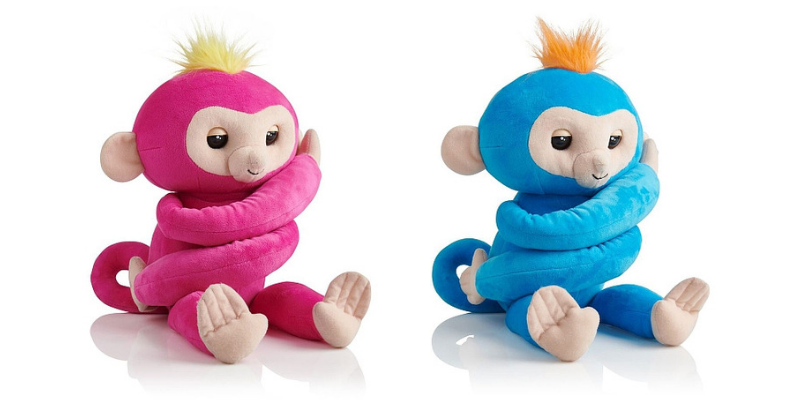 Fingerlings Hugs are interactive plus toys that look just like the original Fingerlings Baby Monkeys. There are two already in stores in Canada: Bella (pink) and Boris (blue). They have long arms that are perfect for hugging, and they both have supersized reactions when you throw them in the air, turn them upside-down or tickle them. Watch out, though, because they burp! Hahahaha yes he would love those!! !